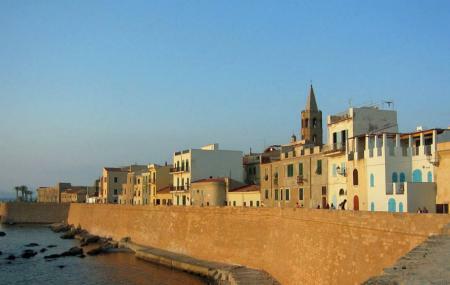 Built around the centro storico during 16th century, stands the famous Sea Walls of Alghero. The Sea Wall did play a significant role in the history of the city. It starts from Piazza Sulis from the south to Porta a Mare in the north. The wall is bordered with pedestrian path where you can stroll for some time to enjoy the magnificent view of Capo Caccia. At the northern tip of the path, stands two tower named Torre della Polveriera and Torre di Sant’Elmo, the only surviving remaining of the city’s battle. Added to this, few restaurants and cafes are located nearby to fill up your appetite. Overall, the path is a perfect place to spend a calm afternoon on a holiday. You can visit the place anytime of the day. How popular is Sea Walls? People normally club together Church Of St. Michael and Torre Della Maddalena while planning their visit to Sea Walls.